Toronto design studio Castor has launched a set of accessories for marijuana users that resembles a vintage candy dish, ahead of Canada's expected legalisation of the drug later this year. "Canada is at the forefront of change with the upcoming nationwide legalisation of cannabis," said Castor in a statement. "It's an opportunity to bring considered, well-designed products to a wider range of existing and new cannabis consumers." Castor created Heirloom Stack for Canadian brand Tokyo Smoke, which focuses on luxury products for marijuana users that "embrace beautiful design along with alternative states of mind," according to its website. 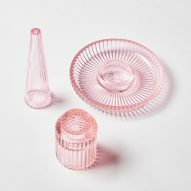 The pink objects are made from heat-resistant pink borosilicate glass, and nest on top of one another when not in use. The ashtray serves as the base, under the grinder, and the cone-shaped pipe sits at the top. 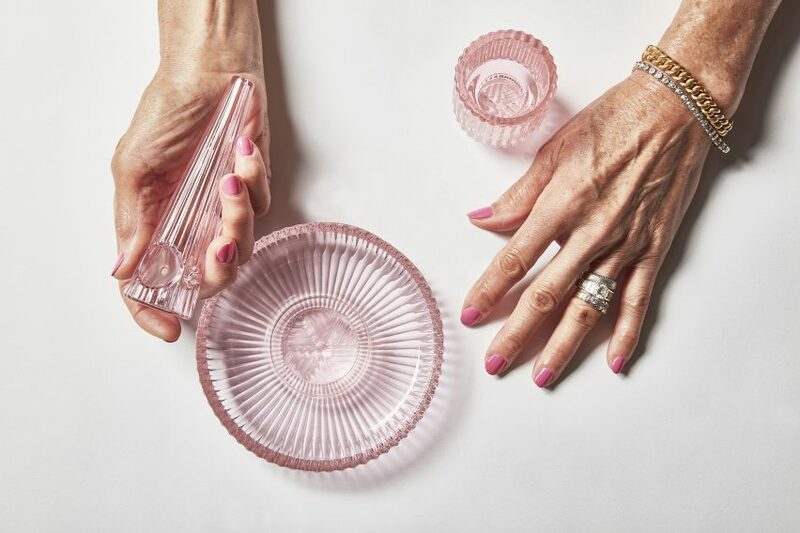 "The set is precisely cast from heat-resistant pink borosilicate glass, and includes all the essentials in one stackable shape: a pipe, an ashtray, and a grinder with a space for storage in its reverse side," Castor explained. Castor sought to play off the idea of a candy dish for the collection. 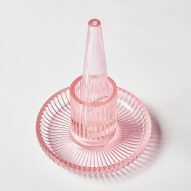 The pink-hued photographs of Heirloom Stack feature an older hand model, which the studio chose to reinforce the idea that people of all ages use marijuana. Other shots show the ashtray filled with assorted mints, another reference to candy jars. 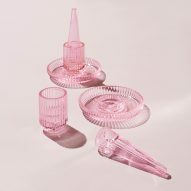 "The three-piece set evokes the charm of a vintage candy dish – one that your grandmother might have owned," said Castor. Canada is set to legalise recreational marijuana on 17 October 2018. Although several provinces already have medical marijuana available for prescription, this will be the first time it will be available commercially nationwide. Marijuana is also now legal is several US states, including Oregon, where OMFGCo and JHL Design designed the interiors for a cannabis dispensary in Portland. For 20 April, or 4/20 – widely celebrated in cannabis culture – Dezeen rounded up five designers creating products for the budding industry. Photography is by Peter Andrew Lusztyk unless stated otherwise.